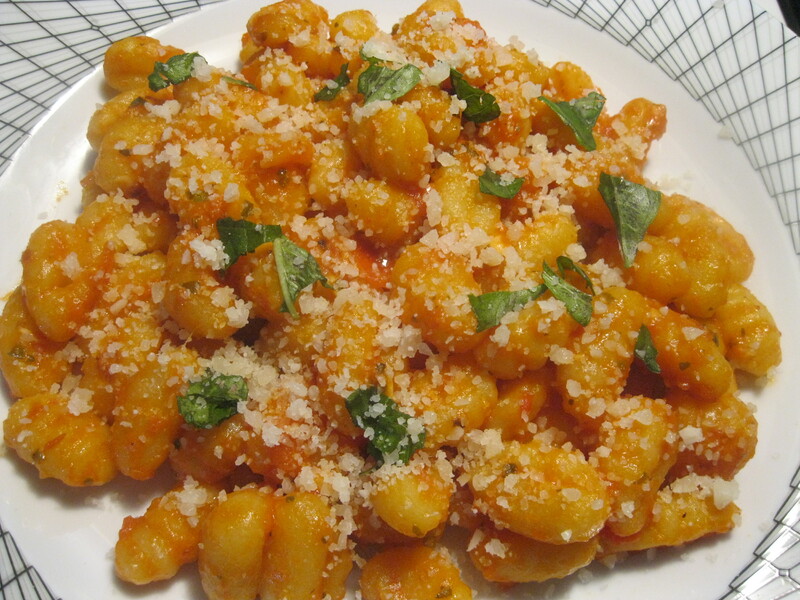 gnocchi | Cooking With Mr. C.
1. Peel potatoes and place them in a steamer for about 30 to 40 minutes until tender. 2. Use a potato ricer to mash potatoes. 3. Add salt to the flour. Then add some flour to the potatoes to absorb the water . 4. Put potatoes on a floured board and use your hands to mix in the remaining flour. 5. Knead in the flour and potatoes until it forms a firm dough. 6. Form some of the dough into a ball and roll into a long rope. 7. Cut into one inch pieces and press lightly with a fork. 8. Place the potato gnocchi in a large pot of salted boiling water until the gnocchi floats to the top. Remove the potato gnocchi with a slotted spoon. It should take about two minutes. 1. Cut off the tops of the tomatoes and submerge in boiling water for around 3 minutes. 2.Remove the tomatoes from the water and place in a bowl of ice water. 3. Peel the skin off the tomatoes, slice in half and scoop out the seeds. 5. In a large skillet sauté the onions and garlic in the olive oil for 3 minutes. 7. Stir in the tomatoes, red wine, basil, and oregano. Simmer for 30-35 minutes.